Keeping quail is an experience that I believe every homesteader should enjoy. If it’s not for all these reasons, or even these delicious quail egg recipes, it’s because they are so darn funny. I did a lot of research before I got Coturnix quail. I knew how many females I needed for each male. I knew how to incubate them and brood them. I had the right setup prepared and the right foods on hand. I thought I was ready. That was before they arrived. Many things the quail do will scare the bejeezus out of you when they first do it. 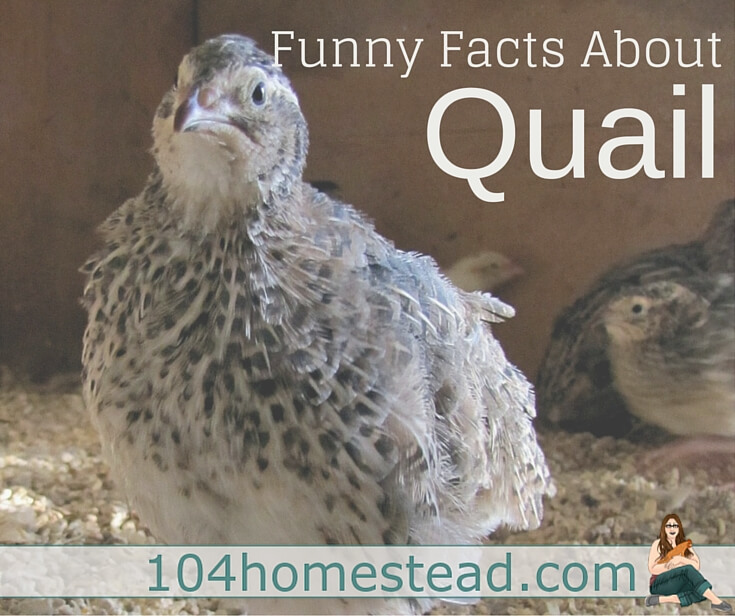 That’s why I felt it was my duty to give you a heads up with these funny facts about quail. It starts from the day they hatch. They splay out like a puppy, usually on their bellies, but sometimes on their sides or back. The first time I looked in the brooder and saw it, I thought the heat lamp had cooked them all. When I opened the lid to check them, they all popped up like little kernels of popcorn. Even as adults, they continue to do this. Never have you heard such a woeful sound. After visiting the brooder or giving out treats the the grownups, they will cry upon your departure. It’s a sad mewing sort of sound. Often it starts with one, but others will join in. Before you know it, there is a whole flock of crying quail. One evening while collecting the final eggs for the day, I discovered one of my quail walking backwards all over the run. I figured he sustained some sort of head trauma or was under attack from some weird virus. After frantically searching online, I discovered he was just constipated. The quick backwards shuffle you see from time to time is the quail eliminating. I’m not sure why, but it is what it is. A favorite activity of all my children is feeding the quail goodies from the garden. They hold them up to the top of the run and the quail will hop up to get the treat. The will also scale up and down their log at an astounding pace. See my son feeding treats to our hopping quail on Instagram. Chickens have an egg laying process. They find the perfect nest, arrange it to suit their preferences, and sit there anywhere from 20 minutes to more than an hour. Ducks have a routine as well. The find the perfect place that you will never look, create a small hole, and sit for about 15 minutes before burying it (again, to keep you always wondering where the heck the eggs are). Quail just pop out eggs as they walk along. My quail’s favorite location is in the dusting bowl while they dust themselves. They don’t even try. They sit there flinging dirt all over the place and when they get up – plop – there’s an egg. No need to build a nest box for these guys. When young male birds first crow, they almost seem surprised by this newly acquired ability. With quail, this surprise never goes away. My males who have been crowing for more than a year are still taken aback every time they do it. I’m not sure how to describe what a surprised quail looks like, but trust me, you’ll know it when you see it. Every time one of the males crows, I instantly think of Steve Urkel. Did I do that? Hopefully this eases your mind a bit when you go out to the coop and see your quail acting oddly. They are just weird little birds. Number one got me when we first got our baby chicks as well! The legs sticking up in the air at odd angles had us convinced they’d all gone to the great farm in the sky. Thanks for posting – quail sound like a lot of fun. Maybe I’ll look into getting some! We have a House pet Bobwhite male that Barks like a dog, makes a sound like the ambulance when he hears it. Makes a purring sound at his Mrs when he makes her a nest. Kissy noises when he finds her a treat. He is paired with a corturnix female and she is endlessly frustrating to him. She stands in the bottom of the cage and yells for him if she can’t see him. He spends hours making her a nest only to fave her fart out an egg while leaning over the food dish. Did you know that Quail can recognize their own egg patterns? He chatters to my husband, patrols the windowsill, Barks at the dogs walking by. Tells him when he wants the light on or off. Runs out and tells me when he needs water, seeds, or wants a bath. Knows when I start cooking and open the fridge. He gets up high to see what I’m doing and mooches anything that looks tasty. He very much considers himself a member of our flock. He is right below my husband and has a mancrush on him. I am of course.. next in line after him. If he alerts and my husband gets up and goes to see. Tells bob that he’s a good boy for spotting the hawk or Eagle out the window. He struts back and forth on the windowsill outside his cage, chest all puffed out. Mimics the ‘pew pew pew’ shooting sounds. It is hilarious.. He sleeps in the top of his cage.. Bob on patrol. Great list. With respect to meat, do you think it is cheaper to raise quail than broilers? That’s hard to answer. You can raise a lot more quail in a smaller space which helps with cost. They also have better feed conversion. Having said that, a broiler feeds a family and it takes a quail or two to feed a person. We just got an app that came out called SmartSteader that calculates cost per pound for produce, milk, and meat. In a year or two I should have a better answer. Thanks for the reply. 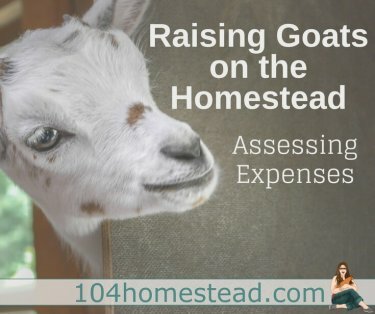 That’s a good app for serious homesteaders. I loved this article! They sound like hysterical little birds and we can’t wait to have our own brood. Thank you! thank you for such a nice article! I learned a lot from the comments as well. I’m in the planning stage of building a day quail aviary/grow house. I think it will be 12 ft by 6 ft and about 5ft 8 in tall. I think I will use cattle panel covered with hardware cloth. I think I will put a clear roofing over top (shade cloth) in the summer. I think I will have a potting/planting counter one one side of the “house” with foam pad on the bottom so the quail don’t jump up and break their necks. I think I will plant bunch grasses, day lilies, ruellia in the bottom. I will have a little shelter on the ground for them. I live in zone 8a. I think I can keep 6 females and 1 male in there. Any other tips or suggestions? You can comfortably fit 35 quail in a space that size, but having less means they’ll have a more natural environment. My only caution is to not grow too attached to anything you plant. They will most likely eat it or dig it up. Also make sure you check to make sure the plants you put in there aren’t toxic to poultry. I know day lilies are okay, but some ornamental grasses are toxic. I’m not familiar with ruellia. Question, a couple actually……we have a silky hen that gets super broody and loves raising babies, any babies in fact, would we be safe for her to raise some quail? We have a “nursery” that she raises her babies in. Also, can then run with out chickens? Any info/comments would be appreciative. The chickens started off as my oldest daughters addiction, but has quickly been taken up by the rest of us. Dang, now I’m super excited to try some quail. ? Silkies make great mamas and they are small enough to hatch quail chicks, just make sure the tiny chicks can’t escape the nursery. They can’t really run with the chickens because of their size (and they are susceptible to infections from chicken poop). With just the silkie, they should be fine. Careful, they are super addictive. 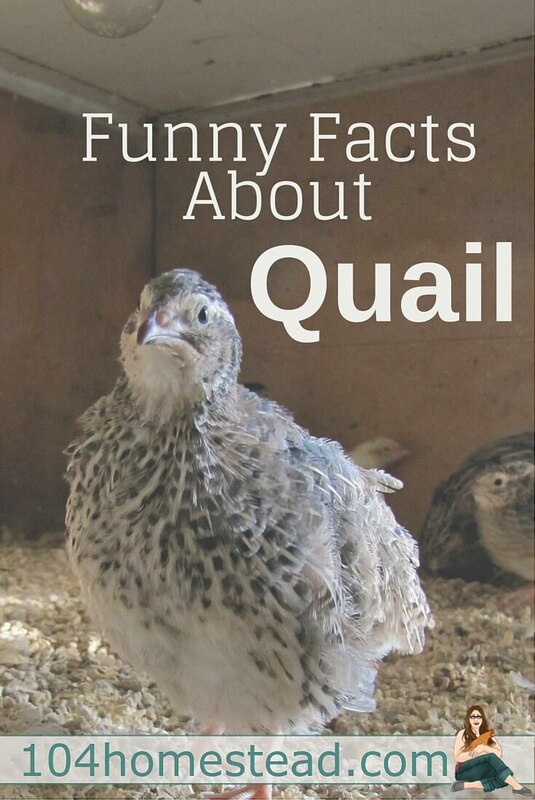 In re #5: If you raise quail in a large, natural space, one that will give them an illusion of the wild but still protect them from predators, then they will not only make nests but they will also sit, hatch and brood the chicks, in fact they make excellent mothers. The male also makes and guards the nest although I have not had one sit yet. It is only because they have been systematically bred as laying machines that most people don’t know they do this. Two more facts for you – quail eggs are not only highly edible but also medicinal, in fact that is why I started raising quail in 2000, to cure my husband’s hay fever and eczema which they did. You will need to raise them organically to get therapeutic grade eggs. Thanks for this list! I currently have a button quail who was a bit down on her luck. Her mate decided to try and kill her after a stressful move, all the little buttons ganging up on her. So she was separated and is a little too traumatized to be around other birds. So she’s been in my care and recovering nicely. I was amazed to see how much she loves her dust bath and how she likes to sing to herself while bathing. But today I had the joy of seeing her run backwards while I tried to figure out if she was dying and why I was such a bad careowner even though I’ve tried everything. And then I came across this list and I felt better. I’ll also try not to be surprised when she starts laying eggs anywhere she pleases. I am glad I curbed that fear for you. I thought the same thing. Sounds interesting! How does the taste of quail eggs and meat compare to the taste of chicken? We love our chickens! The egg taste quite similar to chicken eggs, just a bit richer. Obviously it takes a few more eggs to fill your belly the way a chicken egg does. The meat is akin to partridge, if you’ve ever had it. I have never considered raising quail-until now. I never knew they could be so quirky and entertaining. Plus my kids love the eggs. This may be a future project for my little homestead. You would love them. They are fun little birds. I found that solar lights tend to be too “blue” to trigger laying. The hormone that triggers laying responds to warm wavelengths. This is interesting because as you know I raise them on the ground and the experience is a bit different with the exception of #1 and #5 – The male crow is their mating call and if they’re in a large living space they’ll use it to gather the flock. The Coturnix are so different compared to native breeds, way more domestic. I primarily like this breed for eggs and then meat after the season ends. Are you going to keep a light on them through the cooler temperatures so they keep laying? Sounds like you’re having fun which is awesome! I enjoy my quail way more than chickens, especially the Bobwhites. Have a great week Jessica! I was planning to, but now I’m on the fence. What has your experience been with no adding lighting? Did they stop all together or just slow down? I would like to keep them going a bit so I can fill orders at our local health food store, but I would rather not deal with the electric bill. I keep a light on for the chickens and ducks in both the coop and the run. The quail pen is attached to the end of the run with a big window in their coop. They may get enough diffused light to keep them going. I didn’t use a light on the coturnix because I wanted to keep things all natural. The birds stopped laying in November and started back up the end of March. Take into consideration our temperature difference too. Our first frost doesn’t arrive until November, normally the middle of the month. It was a hard call to not use a light but because I also have chickens letting them rest made sense. The Bobwhites are now 18 weeks, I won’t even get eggs from them until next spring. Primarily I like this birds for the meat and release. How old are they when they start laying. Just got quail and the older bunch seem about fully grown. Love their songs and funny hopping!